Not many of you may still be bathroom singers now. But nearly all of you would have been bathroom dancers as kids. Am I wrong? No, I'm not including you here, Mr. ultra-nerd kid! You were, perhaps, thinking how dense the liquid (called water) is, over your brain, which is actually denser! What all you did in the bathroom, tell me.. as a kid, and an innocent one at that! Like my Mama's son here.. innocent, taking bath in the ultra-huge bathtub! Whenever we went to Jhansi, me and my cousin brother Anshu used to plead my dad to get the thing - I dunno what to call it - the container with the atomizing sprayer coming out of it from one side, used to water the plants - a shower kind, for the veggies. A flower-shower. Veggie-shower. Yes, that. To fill it with water and pour on us. It was a time, when there was no regular water-supply available in the dry, water-starved Bundelkhand region. The city of Jhansi, included. And thus having a shower in the bathroom would have been as vestigial as my sister having some real brains. She'd never use it anyway! So, as my dad would fill it up with water, he'd hold the thing on top of our heads. Maybe add a bit of discontinuity in the water-flow with his hands or something. Me and my brother would strip down, but just as much as till the waist-up. Even as brothers, we had some dignity to keep up to.. Something Ma never passed to joke on about! We'd jump, hold onto each other and skip, get wet, leap like frogs, slip and fall down, get up again. Somebody would pass on a soap in between us, and we'd be scrubbed crazy by somebody, all the while as we jump around. We'd throw the soapy lather at each other in frenzy. Still jumping. Laws of probability would act, as it gets into one of the four eyes. However it becomes a competition of trying to keep a straight face, as born within a difference of just 4 months, one shouldn't be the first to start crying with soap in the eyes. He'd be declared a cry baby. We'd make soap bubbles, only to be destroyed by the jet of water from the hose. Our harried bathing would then finally, conclude. All that stopped as we soon grew up. The ritual was then completely striked out, as soon as the bathroom got real showers fitted. There is however, a slim chance for our kids to do the same, as at least one thing hasn't yet changed in Jhansi. The 24 hours water supply is still a dream. 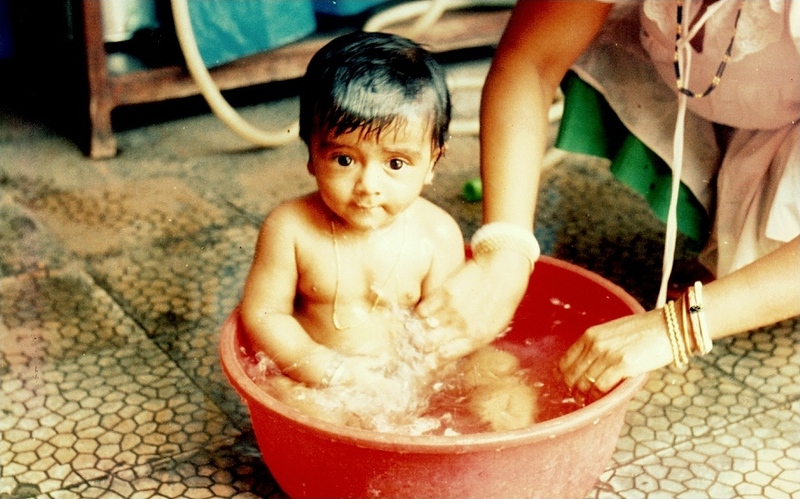 When Anshu used to come to Allahabad, we'd be put out on the courtyard for the sake of taking bath. Ma would still try to get us to strip down completely. And we still maintained our dignity. We would block the water outlet hole with a sock or something. Then we'd start something our generation of kids would like to call 'water-fighting!' Two warriors. Two hoses. Two jets of water. Chaos rules the entire household for at least the next hour. The veranda next to the courtyard would thus experience rain nearly every morning. When water-logging was enough to shift the limelight over to the small puddle of about 5-6 inches, we'd lie in it and squint at the blue sky. As I grew up, I tried weird stuffs. And as I can sense your chain of thought, hold your horses! I'm not talking about growing that old yet.. I would dip my head underwater (inside a bucket, that too..) and feel like the deep sea-diver that I was in my dreams. Would take in my GI.Joe action figures and Devilfish, the assault motor-boat from GI.Joe and drill them for a marine assault. The dual-engine Devilfish had 2 machine guns and 4 torpedoes attached. I'll call this, the acme of imagination, as a full length action movie is being replayed inside the bucket!! Bathing could wait till Ma hollers from parallel dimensions, lying just beyond the door. 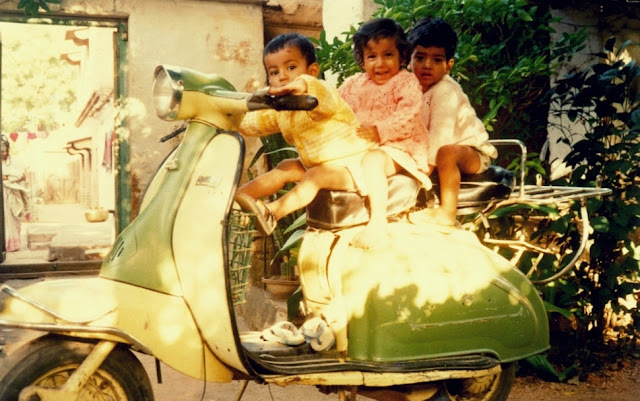 Anshu, didibhai and me, in that order., in Jhansi..
Now to talk about some games we used to play. An embarrassing yet proud revelation, we used to enact 'Ramayana' in our own way. Guess that really proves we are our Dadda's true grandchildren! Ramayana is epic, accepted. But falls short of the awesomeness of Mahabharata. Similar to the Old Testament of Bible, they have the best stories! Anyway, we used to line up some chairs in the courtyard (not the war-zone courtyard, but a different one in Jhansi) to install a make-believe chariot and re-enact Rama and Laxman's journey to Lanka. When didibhai (elder cousin sister) started realizing we're kind of side-lining her, she protested. And we decided to include her in the team. No one really cared that if Sita was with us, why the heck were we on our way to Lanka? Perhaps she was a loan from the evil Ravana for the journey, you know, to cook food or something..
As we grew older for mythological epics, we made that into commando games with imaginary mercenaries attacking us, while still on our way to Lanka. And that makes a good excuse for us to make tents with mum's sarees and climb trees in the afternoon. Till we came to know that the tree we'd climb is haunted.. But then, that's another story! And also the youngest member in the family had arrived, and we didn't really could get on with the fact that Hanuman could be my youngest, cutest, dearest and loveliest sister, Mou. Oh, there's something I forgot to add. So I add it now, as to miss this game would be to neglect all the hard work we had put into pulling it off. Baba had told us about the 'Bermuda Triangle' and we, then kids, did some research on the associated myths. Encyclopedias and GK books became our guide, thank you Dorling Kindersley. We realized it'd be some kind of a radiation trick that made the ships and planes go haywire, and to avoid it, the only thing one could do is.. any ideas? Yes, to hide under the bed and pass from one side to another! Such braniacs were we! Ma should have been more proud. Instead, she used to complain about the dirt that was all that left on our shirt as we came on the other side of the bed, alive and radiation free!! So, what did you do in your childhood? Mine, as you can see, was like living a classic, and I'm V proud of that. haha! i was always afraid of water though.. that head-dipping underwater was an experiMENTAL phase of my life.. :P btw i haven't read from you, anything in your blog for a long time.. thesis keeping you awake at nights, lately? The Torch from the Porch..